November 5, 2016, Bright House Field, Clearwater, FL – Dante Bichette spent his major league career terrorizing pitchers. On a team full of offensive talent, his contributions now come on the mound. The Rhode Island Salty Dogs can attest and, because of this, the East Coast Cardinals earned another championship with a 10-1 victory and the 45+ National title. Bichette (2-0) struck out four against a Salty Dogs team that moved up to the National division after taking home the 2015 American title. Rhode Island finished round-robin play 2-3, before winning a pair of playoff games to reach the championship. While it did commit a trio of errors, the Cardinals came up with the key plays at the most crucial times. On a day when Bichette said he induced an unusual number of ground balls, a fourth inning leadoff single was quickly erased by the first of two East Coast double plays. The play helped East Coast retire 12 of 13 batters during the middle innings and keep Rhode Island from mounting a comeback. 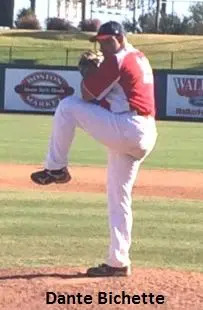 A year after failing to defend their title, the Cardinals completed round-robin play 3-2 and defeated the San Antonio Bombers 9-3 in the semifinals via Hingle’s complete-game effort. Meanwhile Rhode Island needed a pair of playoff victories, including a thrilling comeback, to reach the title game. Trailing the defending champion Brooklyn-Chicago Monarchs 4-1 in the top of the ninth, the Salty Dogs scored four times, including Mike McGee’s go-ahead sacrifice fly, to earn a thrilling 5-4 win. WP: Bichette. LP: Mancuso. 2B: (RI). 2B: Benedict (EC). Pitching: Mancuso, Ward (1), Clark (5), Woodward (8) (RI). Bichette (EC).